Assemblyman Lloyd Levine, D-Van Nuys, says 'over 800,000 pets are abandoned in California' annually. So he has a solution - mandated birth control for 4-month-old dogs and cats. Levine's bill, AB 1634, would require, not request, all dogs and cats to be spayed or neutered. This, Levine believes, would reduce the number of abandoned and ethuanized dogs and cats. His heart is in the right spot, but his reasoning may be a different matter. 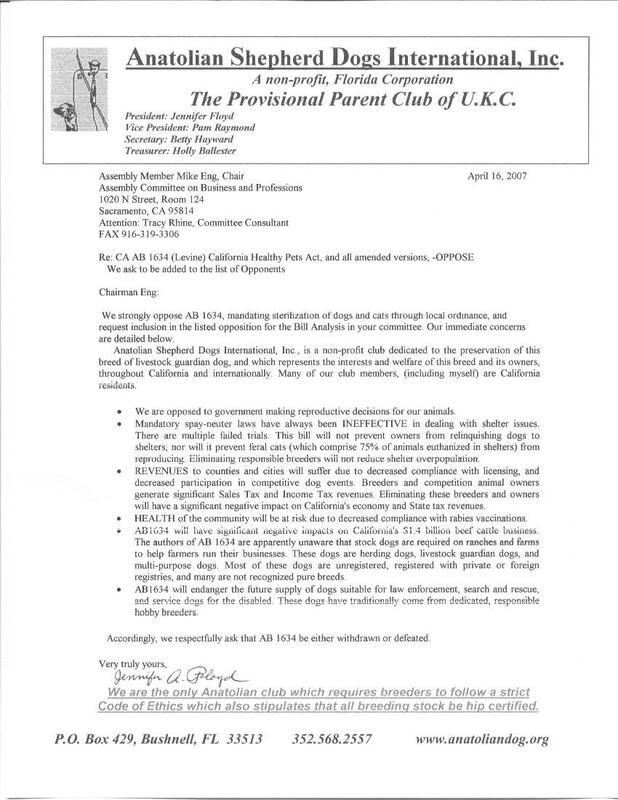 In regards to your recent story, "Bill requires owners to spay or neuter their cats, dogs," (IJ, April 12), we are firm proponents of rigorous canine birth control. However, spaying or castration, especially in juveniles, is not the benign procedure it is purported to be. Abnormal bone growth with concomitant orthopedic problems, muscle loss and obesity with all the ensuing problems as well as a raised incidence of bone cancer, incontinence and painful urination are just a few examples of frequent, serious long-term complications. These facts are undisputed and well documented in the mainstream peer reviewed veterinary literature, yet the unsuspecting puppy-owner is rarely informed about them. In human medicine, this would be considered malpractice. If you truly want to be informed, check the veterinary literature, ask a pediatric endocrinologist or check out this excellent web site: www.saveourdogs.net. In much of Northern and Central Europe, medically unnecessary spaying or castration is illegal - yet these countries do not have a dog overpopulation problem. In Marin County, the Humane Society "imports" dogs from rural counties to adopt them out here. Marin County apparently already has mostly responsible dog owners. In any case, this law will not reach the usual culprits - dog owners in the boonies - whose dogs are semi-feral and have litter after litter under trucks. Such a law would be extremely difficult to enforce and could be evaded by not licensing pets and avoiding vaccinations and veterinary care. It will further open the doors for poorly bred and unhealthy dogs from puppy mills in other states.